Never before in the history of democracy in Sri Lanka, destiny has placed the common good of the nation on the shoulders of four minor political parties, JVP, TNA, SLMC and ACMC, of which the first is progressive and national in vision and the other three are ethnic in composition and regional or sectarian in outlook. With the two major parties, UNP and SLFP/SLPP that are equally corrupt and opportunistic but locked in a do or die power struggle, while an impulsive President is utterly clueless about conducting his office within the parameters set by the constitution, and while the judiciary is yet to pass its verdict on charges and counter charges filed by the two main contenders, the country’s economy is tottering to remain steady and facing a dangerous precipice. The ultimate victims of this power struggle are the people left in a quandary as to who is governing over them and whom to approach for assistance for their economic ills. The fact that they have not come to the streets like in France is a testimony for their forbearance. Whether there is going to be a general election sooner or later or whether the President is arbitrarily going to nominate an interim government until the time is legally right for dissolution of parliament, the issue facing the nation is the future of democracy under the current Republican Constitution. The minority communities and their leaders should realise that an alliance between an ethno-nationalistic majoritarian government and a president elected with the same mindset will be detrimental for the good of their communities, and in the long run, the nation. Therefore their choice is not between UNP and SLFP/SLPP, both of which speak with forked tongue and pass different messages to different constituencies, but between these two and a third but one that is progressive with a solid base in the majority community. It is only such an alternative that will have the guts to carry the same message through every part of the country. The common good of the nation lies in the rule of a grand coalition between the majority and minority communities cemented by an agenda that treats every citizen a Sri Lankan irrespective of that citizen’s religious and ethnic belonging. That coalition needs to re-write the JR constitution or seriously amend it to prevent the recurrence of more Sirisenas in future hijacking it and paving the way for a dictatorship. So far JVP has shown its readiness for such an alliance with the minorities and willingness to do away with the executive presidency. With moneyed interests in the country backing one or the other of the two major parties, this coalition may not win a majority of seats to form a government on its own. However, it will have sufficient number of seats to influence the policies and direction of whichever party that wants to form a government. It was disappointing to note that TNA, in its last meeting with President Sirisena, engaging in a cheap bargain for not supporting a possible impeachment motion against him in return for the quick release of Tamil prisoners and lands held by the army. Without denying the legitimacy of the prisoner and land issues however, it should be stressed that those issues will find easy solution under a progressive coalition with a common agenda for the common good of the nation and not for a particular community. There is no hiding the fact that SLMC and ACMC are parties driven not by any grand principles or policies but by personal and regional differences and aspirations. Given the current turmoil in the country this is a luxury that they can ill afford. Gone are the days when Muslim leaders could engage in opportunistic politics to win favours from ruling parties. It is time these parties join hands with progressive forces within the majority community and work for the common good. Let a JVP-TNA-SLMC-ACMC coalition add real substance to the hitherto vacuous call for UNITY IN DIVERSITY. They can form Sri Lankan Green Party (SLGP) with the greenest constitution ever witnessed in the world. One thing she is ready is the economic development via the best Reaserach, Science and Technology there is in a sustainable way. There is no identity politics when we live by the Environmental Fundamentals. All cultural/religious values can only be enhanced via this politics. We should sit together with all the advanced Nations and offer them a joint ‘contract’ to come up with a Master Plan/Green Development Plan that reflects all the lessons learned in their journey to better life. There is no Nation like us economically/strategically/logistical placed for futuristic Visionaries/Think tanks to set a paradise of a Green Living setting example for humanity period. This is the only form of cure there is for SL as she has nothing done to her since Independence. In fact she is has gone down in living standards a failed Nation requires this Gross National Happiness (GNH) for cure for all her illnesses. Peace and Reconciliation process/LLRC/War crimes tribunal/Current Constitutional assembly/Provincial councils are the wrong medicines. This will be the best way the ‘thinking out of the box Sri Lankans’ can confront the gradual militarisation of the Indian Ocean too. We need to unit and have a very coheasive foreign policy that be supported by the worlds ‘just’ population. We need to have a comprehensive policy that sets president at the UN the future of our planet through our living and thinking curtailing all the wrong adventures by the powerful……basically this will link the world to us for all the right reasons. War crimes in Sri Lanka are all connected to this geo political blunder is the point. The green politics that sets the law of the seas too will prevent/account the perpetrators of ocean pollution/nuclear waste etc. War crime tribunal does not bring the TNA/GOSL/JVP and the Foreign sponsors to account to the Sri Lankan people. It does the opposite leaving all the crimes unaccounted and focus on the last few days CONVENIENTLY for the few. This we can not live with is the point. If we have a through examination of all what took place (start referring to Suthenthiran historical writing and the sister versions down South)then we can have part of debt written off by the International lenders too as compensation. Hon late Mrs Gandhi and her Family/Hon late President Premadasa/Hon late Bhutto family/Alfred Thuriappa/ Thiagarajah’s were killed in a certain time span 70’s onwards turmoil in the region have one thing in common Nationalist with patriotism for a united future and building bridges. These were no accidents. Get the bigger picture before belittle the fellow man next door for all the petty little things. TNA very often put the cart before the horse or close the stables after the horse has bolted. They also try to revive a ‘dead snake’ to show their voters that the are at it. Finally they will tell their voters they din’t know to which side of the horse the cart should have been – that they din’t realize the horse has bolted and had mistaken the snake to be alive. It appears that TNA has lost its stand with the Tamils and are trying to score a point with the Sinhalese, who will ride on them and let them down like a lump of horse dung. It is time these parties join hands with progressive forces within the majority community and work for the common good. Bargaining is always counterproductive and it diminishes the national minorities. The events in the past 4/5 weeks has amply demonstrated that this country needs a new Constitution. JRJs Constitution with its amendments galore has created unforeseen political developments that has created more problems than solutions! 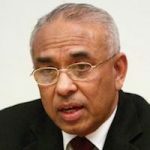 A timely and realistic opinion Ameer Ali given the present political unstability in Sri Lanka. An alliance of front line minority parties with the JVP will go a long way in turning the trends towards a healthy situation. TNA , SLMC and ACMC must merge into one. JD on A Post Script: Easter Sunday Bombing – More Questions To Minister & Ministry Of Defence, Law & OrderLAw enforcement did not act further on it because of political influence.